Nothing beats bacon! These lactose free bacon-wrapped pears are pretty tasty, and they make for the perfect afternoon treat. This recipe makes roughly two-dozen appetizer servings, and each tasty pear is completely covered with warm, crunchy bacon. The dish is perfect to whip up as an appetizer for a family dinner or a large get-together, and it can be made in less than 20 minutes or so. After trying it, please feel free to rate and review it, and make sure to share this one with your family and friends on Facebook, Twitter and Pinterest. Our bacon-wrapped pears recipe is pretty easy to follow, and it only calls for a few basic ingredients. To get started preheat your oven to 375°F, and then bake 12 slices of bacon for 8 to 12 minutes. Now, while we all love really crispy bacon, you don’t want your bacon to get too crispy—once the bacon is cooked, you’re going to cut each slice in half and wrap your pear slices with the halves. If the bacon is too crispy, it won’t wrap around the pear slices properly. Also, make sure to cut your pears into eight slices, and brush lemon juice on each slice as well. Serve everything at room temperature. If that’s not enough bacon for you, you’ll love our Bacon Wrapped Cheese Burgers! They combine Italian sausage, ground sirloin and our Sharp Lite50 Cheddar to create a mouthwatering burger that’s to die for. 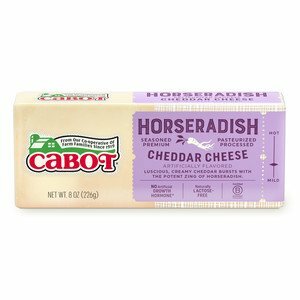 At Cabot, we work hard to produce a wide range of top-notch dairy products. We’re confident that every recipe that features our cheese will be a real winner in your house, but we want to make sure that you truly enjoy these recipes. After trying this bacon wrapped cheese burgers recipe, please make sure to rate and review it—we can’t wait to hear what you have to say about this delicious dish. LINE baking sheet with sides with foil. Place bacon slices in single layer on sheet. Bake for 8 to 12 minutes, watching carefully toward end, or until bacon is cooked but still very pliable, not crisp. CUT each pear into about 8 wedges, removing any center core or seeds. Brush cut sides with lemon juice. MAKE shavings of cheddar with vegetable peeler and drape some over each pear wedge. 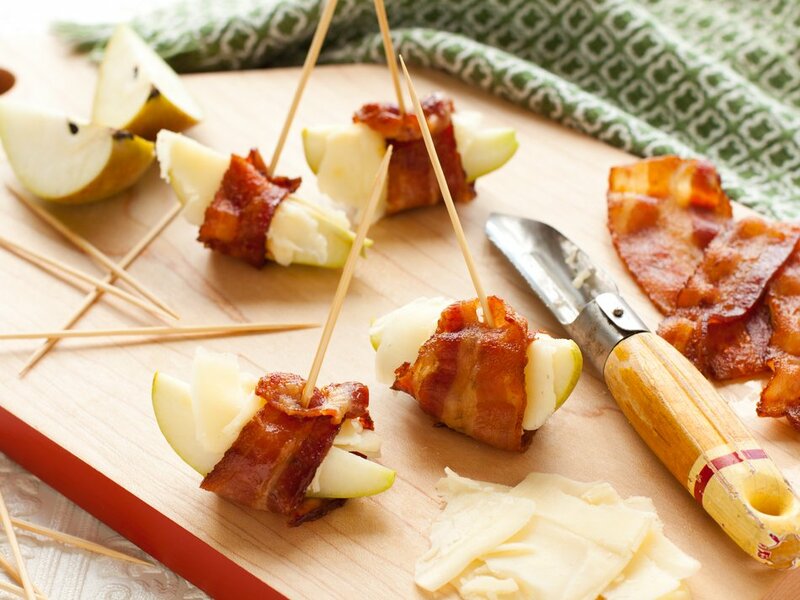 While still hot, cut each cooked bacon slice in half and wrap around pear and cheese, holding in place with toothpick. Serve at room temperature.